ComplianceForge is an industry leader in NIST 800-171 compliance. Our solutions have helped customers that range from the Fortune 500 down to small and medium-sized businesses comply with this DFARS requirement. Our products are scalable, professionally-written and affordable. What ComplianceForge Products Apply To NIST 800-171 Compliance? Complying with the requirements from DFARS goes beyond just having policies and standards. When you break down the requirements to comply with DFARS / NIST 800-171, you will see how ComplianceForge's products address a specific DFARS compliance need. In the chart, "NFO" stands for Non-Federal Organization. NFO controls are required for contractors and are called out in Appendix E of NIST 800-171. We offer several bundles of our products, based on client needs. Some clients want just enough to get by to be considered compliant with NIST 800-171 and some clients want everything we sell, so we have options to meet every need! Note - If you are interested in the Digital Security Program (DSP), instead of the WISP, we offer several NIST 800-171 bundles that contain the DSP. If you are not sure if you need the DSP or WISP, click here to learn more about the differences. Cybersecurity policies & standards in an editable Microsoft Word format. For the NIST 800-53 version of the WISP, each of the NIST 800-53 rev4 families has a policy associated with it, so there is a total of 26 policies. For the DSP, there are 32 different domains with a policy associated with each domain. Under each of the policies are standards that support those policy statements. These standards provide you with coverage for the moderate control set from NIST 800-53 rev 4, which is needed for NIST 800-171 compliance when you look at both CUI and NFO control requirements. This is our “consultant in a box” NIST 800-171 checklist in an editable Microsoft Excel format. 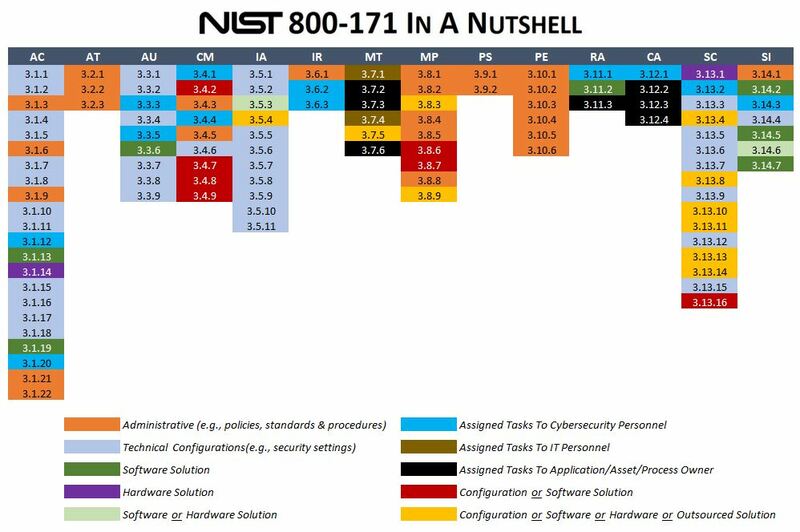 Each of the NIST 800-171 controls from Appendix D is mapped to its corresponding NIST 800-53 control. The NCC also covers Appendix E Non-Federal Organization (NFO) controls. The NCC maps into the WISP and DSP products, so they work in concert together for helping you comply with NIST 800-171. These are fully editable templates. One template is a Microsoft Word-based System Security Plan (SSP) that contains all the criteria necessary to have your SSP documented to meet NIST 800-171 compliance expectations. One template is a Microsoft Excel-based Plan of Action & Milestones (POA&M) that contains fields necessary to track control deficiencies from identification through remediation. Given the difficult nature of writing templated procedure statements, we aimed for approximately a "75% solution" since it is impossible write a 100% complete cookie cutter procedure statement that can be equally applied across multiple organizations. What this means is ComplianceForge did the heavy lifting and you just need to fine-tune the procedure with the specifics that only you would know to make it applicable to your organization. It is pretty much filling in the blanks and following the helpful guidance that we provide to identify the who/what/when/where/why/how to make it complete. The NIST 800-171 CSOP is mapped to NIST 800-53 and NIST 800-171 requirements. The CRAT supports the RMP product in answering the “how?” questions for how your company manages risk. The CRAT directly supports the RMP, as well as the WISP and DSP policies and standards, for managing cybersecurity risk. It does this by enabling your company to produce risk assessment reports. The SPBD addresses the “how?” questions for how your company ensures both security and privacy principles are operationalized. The concept of “secure engineering” is mandatory in numerous statutory, regulatory and contractual requirements. The SPBD provides a “paint by numbers” approach to ensure your company has evidence of both due care and due diligence for operationalizing security and privacy principles. 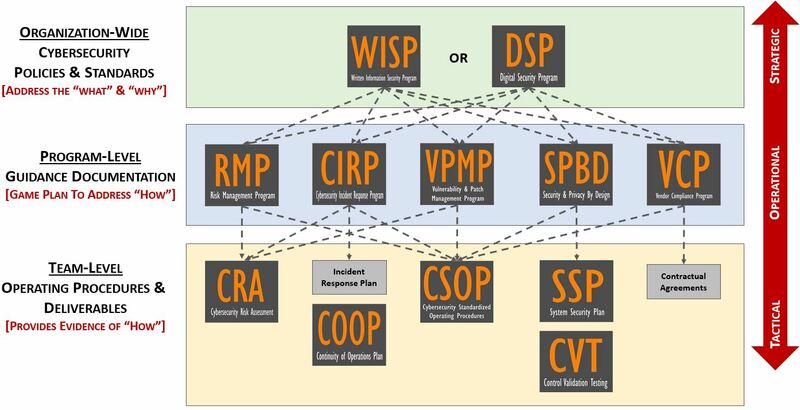 The CIRP is based on numerous frameworks, but the core is NIST 800-160, which is the de facto standard on secure engineering. The NCP is the "easy button" for complying with NIST 800-171. It contains NIST 800-171 specific policies, standards, procedures, SSP and POA&M templates. This is the most cost-effective way to comply with NIST 800-171. This bundle is similar to NIST 800-171 Bundle #3, but tailored for smaller organizations. It is the "easy button" option for NIST 800-171 compliance when alignment with NIST 800-53 would be considered overkill. You will not go wrong with this package. This contains everything you need: policies, standards, procedures, SSP & POA&M templates. The CSOP alone can save you hundreds of hours of writing NIST 800-171 cybersecurity procedures! Our most popular NIST 800-171 bundle! This includes everything from bundle #2 but adds robust incident response program documentation, the Cybersecurity Incident Response Program (CIRP). Incident response is key to DFARS compliance. Bundle #4 is "the whole enchilada" for NIST 800-171 since you are getting all the NIST 800-171-related documentation we offer to build out a robust and compliant security program.